After getting into Barcelona we only had 2 hours so we went to a grocery store and got some food for the trip. Gary’s Ankle hurt so he sat down in the train station and I walked around a little bit. While I was gone the police came and yelled at Gary for leaning to far down in his chair and also for letting his head rest on the chair he was sitting on. Apparently it’s not allowed to sit in any position except straight up. Gary was pretty annoyed and had some words with the police man which I did not understand. Even if I could understand them I don’t think I would write them down. We hoped on our train and I met a nice french girl to talk to for a few hours while our train trailed along the cost. It was one of the most beautiful areas I’ve seen on the train up to there. The beaches were gorgeous and there were whole towns built into the cliff sides. I wish I’d taken some pictures but I didn’t, sorry. The rest the story goes like this, Gary and I lived in that half awake, half asleep state of consciousness that all travelers know too well. Before we got to Narbonne a team of engineers showed up and change the size of the axles on the train to match the size of France’s rails. Don’t ask me how. 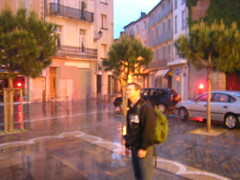 Once we were in Narbonne we ate some sandwhiches and walked around the drizzling dark town. Around 9:40 we found the town square. A Measly little monument with nothing much to show for it. From there it was a three hour lay over and then what ended up 9 hours in the train(one hour late arriving in the morning). The train was pretty pimp though, each cabin had six beds stacked in two rows three beds high. 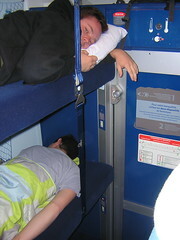 Gary and I even got top bunks! Goodnight, tomorrow Paris and Reims. Not only did you see action probably, hopefully you finally got some sleep. You certainly pick the interesting times to be in France. See any action today??? Hey go approve me as your contact on couchsurfing. I needs to get some contacts so we can find a place to stay in San Fran.